My Fashion Law class concluded a couple of weeks ago and I suggested to our professors that we host an end of semester Happy Hour. This was the first semester that the class was offered to both law students and business students at the same time. Also, there are already countless graduation celebrations - so what is one more? In researching a place, I wanted to pick somewhere that would be well-lit, not too loud and offer a variety of beverages and nibbles. I also wanted to look for somewhere near campus, as that is a central meeting place for all of us. I ultimately decided to go with Corkbuzz Wine Studio (http://www.corkbuzz.com/), located near Union Square. I ordered the $15 Blind Tasting of White Wine (also offered in Red Wine too). This deal features three 2oz pours of wine but you don't know what varietal of wine it is - hence the Blind Tasting aspect of it. I'm not sure when it is offered - we went on a Monday and I was told it is offered until 6pm. I couldn't tell from the website if it daily or only on certain days - make sure to ask when you go! When you check in on your first visit here (I don't remember if it was Yelp! or Foursquare) you receive a complimentary flute of sparkling wine. Do it! We ordered some nibbles to share. We got the Crispy Fingerling Potatoes with cilantro, red chile and black garlic aioli. Although the aioli looks like disgusting brownish goo, it is DELICIOUS. Do not be scared of it, embrace it! We also ordered the chef's selection of cheeses. I believe it included a semi-soft cheese, blue cheese and ricotta. It would have been nice if there was a jam or fruit paste served with it to offer a contrast. This location has a great vibe to it and the perfect ambiance for a date, dinner with friends or family gathering. Maybe don't come here to watch the game, but other than that, this is a great location. I'd like to come back here sometime for brunch or dinner. Where Did I Ever Eat B4? I caught up with my best friend's (WARREN!!) sister-in-law Tammi last night for dinner! She was visiting the city from Philadelphia with some of her girlfriends. As the resident local, I knew I needed to recommend an awesome spot for dinner that was very New York! Two friends, Lauren and Elizabeth, recently raved about B4 (http://www.b4nyc.com/), a New American restaurant that serves up reinvented comfort food in the East Village. While we were looking over the menu, we were enjoying the delicious bread. There is a toasted garlic-bread and a fluffier focaccia style bread. I was glad they were generous with the refills! I ordered a glass of the Cabernet Sauvignon. Serving it in a mason jar was on theme for the restaurant but I prefer a wine glass. My grandma heavily influenced me into believing that the glassware changes the taste of the wine. I'm sure it's in my head, but it does change my perception. We ate our meal family style and shared all of the courses. The first course was a bit tricky - Butternut Squash SOUP! The dish was fantastic so we got over sharing from the same bowl. The flavor of the soup tasted like the butternut squash had been prepared with apple juice, onions and a hearty broth. Like a traditional casserole, it was dotted with marshmallows. This sweetness brought out the flavor. It also had a sherry-infused cream drizzle. 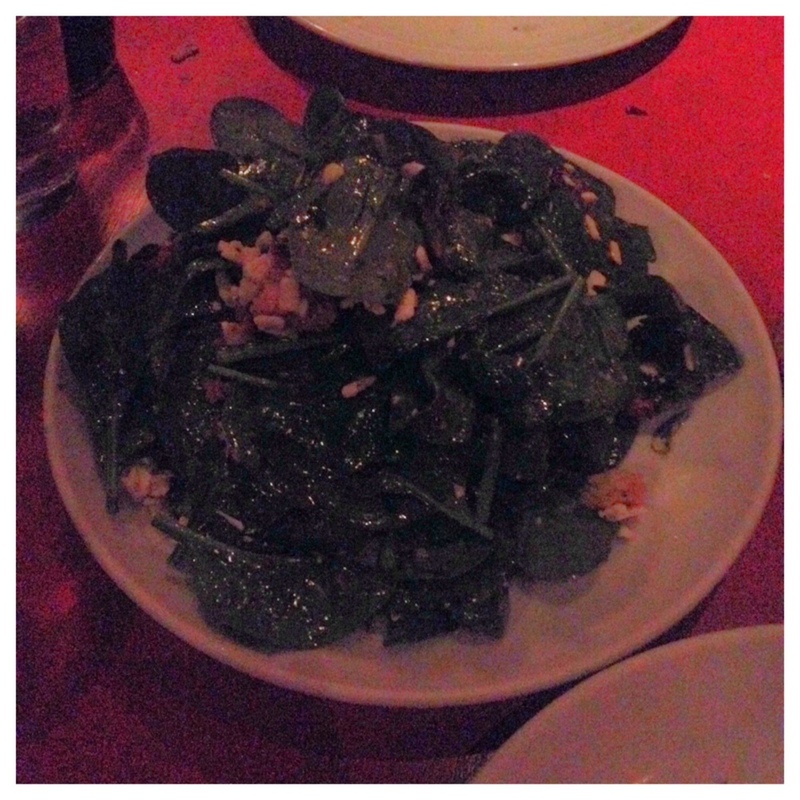 The sweetness of the pears and the sharpness of the Gorgonzola balanced the peppery bite of the arugula. It was topped with a honey chili vinaigrette and spiked pumpkin seeds. Loved it! Kale is still super popular, which is great for me because it is yummy! This salad was served with an herb buttermilk dressing, cucumbers (HUGE slices), pickled red onions (gave great flavor and color) and cornbread croutons. This meat was delicious and moist!!! The pan seared heritage pork chop was served with an apple bourbon reduction and a warm fennel-cabbage-red onion slaw. The combo of the slaw and the sauce were scrumptious! This dish was my least favorite. The raviolis were served in a sage brown butter sauce. The filling wasn't that flavorful or that plentiful - they could have been a bit more stuffed. Also, the duck confit seemed a bit overdone - I think it was potentially over fried. It was still good, but compared to all the other knock-out dishes, it didn't stand a chance. I loved this dish! The butter poached salmon had a mustard glaze, shitakes, red peppers and an INSANELY awesome butternut squash wild rice salad. I could eat that salad by the bucket! The salmon was also the perfect temperature - medium/medium rare and so tender. If you come here, YOU MUST GET THIS DISH! By far the star of the night. A pan-seared Moulard Duck Breast is prepared in a General Tso's style. It is served on top of a ginger carrot puree with haricots verts (fancy Fresh green beans). I wish I just ordered this for myself so I wouldn't have to share it, it was THAT good! Check out the awesome vibe of the spot - so relaxed and welcoming. Don't you just want to come on in? This is a wonderful restaurant. It has outstanding food and an inviting atmosphere. I look forward to coming here again and trying more dishes. I have the pleasure of serving as a Teaching Fellow for an undergraduate course. As part of the course, my class (along with four other sections) traveled to Santiago, Chile for about a week to learn more about international business and specifically business in Chile. There were over 200 people on this trip - we all made it back in one piece (mostly)! We got dressed up and called taxis to get to the restaurant. Me and the "kids" - to be young again! Once we arrived at the restaurant, there was a bit of a SNAFU. Allegedly, the restaurant never got our reservation - that pesky internet can be unreliable! Oh well, our group was resilient and the host made a reservation for us at incredible restaurant: Astrid y Gaston (http://astridygaston.com/). You will need to translate the page with Google to English...unless, of course, you can read Spanish! This is one of the top ranked restaurants in Latin America as well as the world. It is Peruvian - my friends that are Peruvian are quite proud of this culinary gem! The restaurant is located in a house - so cozy! We did the Tasting Menu with the Wine Pairing. There were 6 courses and as many (if not more!) wine pairings. The food was spectacular and the wine complemented each course. It is one of my most memorable meals to date; not only for the food but for the company as well. Beautiful Place Setting. I'm ready to eat! NOM! If the table setting was an indication of the quality of the food, I knew I would be in for a real treat. We were served up delicious bread. It wasn't just tasty, it was warm! There was a hearty brown bread, a garlic focaccia-like bread and a seeded roll. The butter was also delicious - the perfect temperature. I hate when it is too cold. Catch 22 - the bread! BEWARE! As we hit the 5th course, I knew I shouldn't have eaten any of the bread. I got too excited at the beginning. Next time, I need to think that a Tasting Menu is a marathon...not a sprint! Now...the first course! Art or food? Either way, it is edible and incredible! I tried to get the exact descriptions off the site, but naturally, this is a struggle because the menu changes daily and it is translated oddly. It would have been nice to have gotten a printed menu, but oh well! On the left, was a puréed sweet potato stacked with crab and served with two sauces that brought out the flavor profile. On the right, a beautifully prepared ceviche. Next up, the second course! Can you handle this presentation? What is that above you ask? Let me tell you! On the left, a freshly prepared scallop served in its shell and on the right, a panko-crusted shrimp. I loved both of these! Salmon - the seafood can't stop, won't stop! This course was a great combination - salmon served over risotto with a shrimp sauce. All over Santiago, I saw on the menu a super expensive type of crab: large spiny crab. About $200! This pasta had a bit of the meat in it to not break the bank. Very tasty though! How cute is the sunny-side up egg? The last savory course was veal served with a soy-sauce, egg, french fries (or as the Chileans say, papas fritas! ), and rice. I really liked the taste combo but I couldn't finish it. I was too full! I even had to pump the breaks on the wine - so cray cray! How do you eat this? Quickly, of course! This plate was full of stars! From left to right, a hot fruit soufflé, sorbets served in a cookie shell and Peruvian style donuts with ice cream! This was an incredible meal and a great deal! The food was $60 and the wine pairings $24! In NYC, a similar experience could be over $200 a person. If you find yourself in Santiago, Chile and have time for an incredible meal (it took about 3 hours), this is the place to go! So Tasty, it Will Leave You Numb! I heard so many RAVE reviews of Han Dynasty (http://www.handynasty.net/) that when Liv suggested going to dinner here with Christine, I was thrilled! This lovely Szechuan restaurant has locations in Philly and Cherry Hill, NJ as well. Now that it is in the East Village, there is simply no reason to not RUN here! This restaurant is quite popular and does not take reservations. However, they have an iPad reservation system, so if you are nearby, stop in and give the hostess your phone number. You can grab a cocktail at any of the nearby bars in the East Village and get a text when you are ready to be seated! We ordered a bottle of wine for the three of us. The pricing is incredible - we got a nice bottle (Dreaming Tree) of Cabernet for about $30. 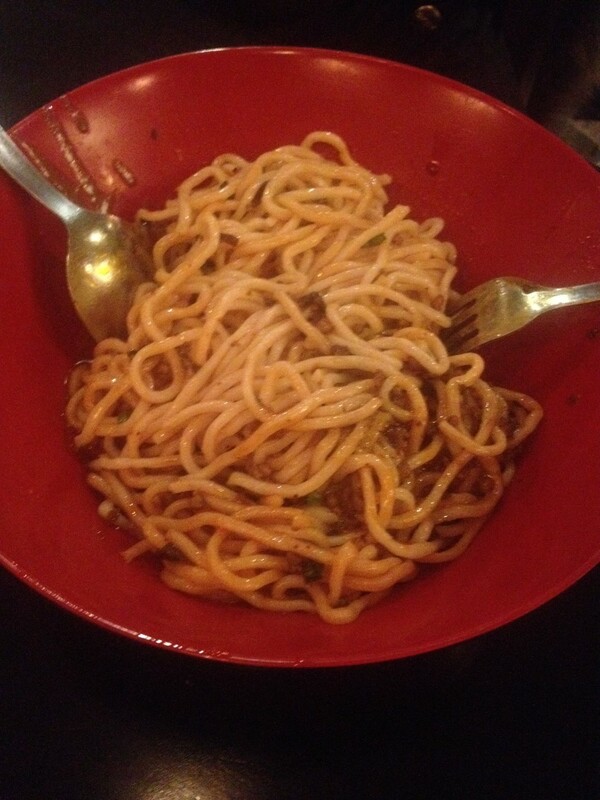 To start, we obviously got the Dan Dan Noodles. THESE ARE SO YUMMY! I could have easily eaten the whole bowl myself, but I remember that we ordered other food, so I held back. The spicy level was high (8 out of 10) but it is more of a numbing heat than a hot heat if that makes sense. I've found many times I've had Thai food that is significantly spicier even if it is only "medium" at the restaurant. It is the type of spice that matters as much, if not more, than the quantity! Aside from the Dan Dan Noodles, we asked for the gentleman that took our order to give us some guidance on what to order. He suggested the Spicy Crispy Cucumber, Dumplings in Chili Oil, String Beans with Minced Pork, and the Dry Pot Style Lamb. These were yummy! They had a great bite to them and were a nice contrast to some of the heavier/carby dishes. I highly recommend them. SO TASTY! I could eat a bucket of these. You get at least 6 dumplings, so it is certainly enough to share with others, or be selfish and just get for yourself! These string beans were ok but couldn't compare with the rest of the dishes. The amount of pork wasn't really anything to write home about. Next time, I would order a different veggie dish. This is the style of preparation that Han Dynasty is famous for!! The entrée is served in a sizzling mini wok and cooked in a spicy hot pot sauce with black mushrooms, bamboo shoots, bell peppers and Sichuan peppercorns. We were advised to get it with a fattier protein than chicken so we got lamb. It was very tender and delicious! Normally this is the spiciest item on the menu (10 out of 10) and we asked for it at a level 5. I loved eating and could not feel my lips afterwards, so who knows how much the spice was actually adjusted. This is somewhere I will take my parents when they visit. My dad LOVES spicy food and I know he will greatly enjoy eating here! Check this spot out and try going during off-times to avoid the lines! I first visited Hill and Bay a couple of weeks ago for drinks and planned to return for a meal. The opportunity struck when I wanted to grab dinner with a date before a movie at Kips Bay Theater. Side Note: We saw Dallas Buyer's Club and it was great. 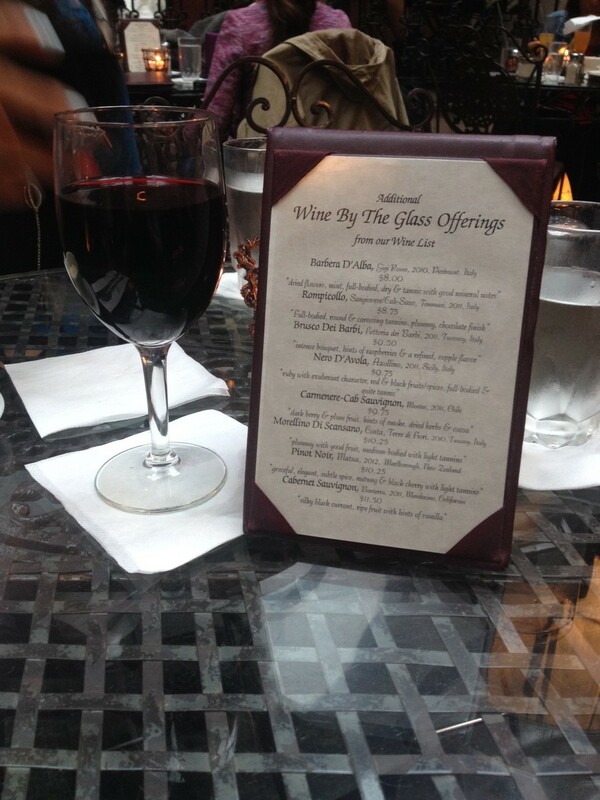 I looked at the wine list and decided to order a glass of red wine. I can't recall which varietal I ordered - all glasses are price between $9 to $12. I knew I wanted to order the Braised Short Ribs, served with creamy polenta and crispy shallots ($23). Based on Yelp! reviews, this seemed like a safe bet and I do love cooking this dish at home! The meat was absolutely tender. The wine I ordered really complemented the sauce. I was so happy with what I ordered! When I looked at the dessert menu, I knew exactly what I was going to order! I love bread pudding, so naturally I ordered the Brown Butter Chocolate Bread Pudding, made with dark chocolate and served with ice cream ($8). This is my favorite type of dessert: the juxtaposition of the hot (bread pudding) and the cold (ice cream) rocks my world. So yummy! I'm glad I came back to this spot. Solid entrees and desserts! A Dinner in a Snow Storm! A Delightful Meal at Craftbar! Last week, there was a bit of a snow storm! Did it stop me from meeting Ingrid and her friend Ashley (up from sunny Bermuda) for dinner? Of course not! Ingrid lives in Flatiron and suggested Craftbar (http://www.craftrestaurantsinc.com/craftbar-new-york/). I wanted to go to that spot for a while. Also, the snow didn't stop the train from running, so I bundled up and met her! In order to cope with the snow, we ordered a bottle of Montepulciano (I have to thank my friend Melissa for opening my eyes to this wonderful red varietal!). The bottle was reasonably priced around $30. An Affordable Bottle of Red that is ALSO delicious? Happiness! We decided to split two appetizers. The Pickle Jar and the Pecorino Arancini, served with spicy tomato sauce. The pickles, including other vegetables like cauliflower, were a bit to sour. Some of the vegetables were too porous and absorbed too much of the pickling liquid. The Arancini, or rather the yummy balls of risotto and cheese, were so tasty! Much better than the pickles. For our entrees, Ingrid and Ashley both ordered the Veal Ricotta Meatballs & Capellini, served with Basil and San Marzano Tomato. Ingrid didn't finish her meatballs so I gave her a hand and tasted them. They were delicious! I chose the Skate, served with Brussels Sprouts, Apple, Brown Butter, Crème Fraiche and Horseradish. SO TASTY! I love Skate and the preparation really complemented the character of the fish. To round out the meal, we split a dessert: The Flourless Chocolate Cake, served with Passion Fruit Caramel and Coconut Ice Cream. The dessert was a wonderful conclusion to an all-around outstanding meal. The food and service are both top-notch. I look forward to coming back! Baoburg in Williamsburg is a Little Gem! Last week, I caught up with Christine at a lovely little (this is an understatement!) restaurant in Williamsburg. The spot is called Baoburg (http://baoburgnyc.com/) and it describes itself as "artisanal cuisine" - the dishes certainly lived up to this hype. The restaurant has about 20 seats and many of the seats are counter style. We ended up sitting on two counter seats facing a mirror. This choice made it easy for me to check that I had nothing in my teeth, an unintended benefit. To start our meal, we ordered a bottle of Ramon Bilbao Albarino, a nice Spanish white that was reasonably priced at $25. Our server presented the wine a bit awkwardly. It wasn't chilled already, so he brought it over in an ice bucket but did not open it. We were sort of confused since the bottle cap was a screw off - do we open our own bottles now? Is that what "artisanal" means? I attempted to take it off and it didn't work, so I asked the server. Naturally, I loosened it for him so it was soooo easy for him to open. Once it was open, it was a nice wine. We were desperate for a drink, so warm was going to have to do for the first pour! We ordered several plates to share and were very pleased with our choices! We started with the Cheesy Truffle Fries with BACON ($7). The fries were a lovely start while we waited for our entrees to come. French Fries TOTALLY count as vegetables! Our first entrée that arrived was the Sparkling Ribs ($12), grilled baby back ribs tossed in a Cola cider sauce with truffle fries potatoes and a pickled garnish. This was absolutely fantastic! I was concerned I'd have to eat the ribs with my hands and this would result in sticky fingers. To my delight, the ribs were fall-off-the-bone tender. The cola marinade was so yummy. Our next arrival was the Lamb Stew. I didn't take a snap of the menu and the entrée must be new as it is not yet on the Baoburg site. The dish was fantastic and influenced by Asian flavors. It was served with a poached egg on top, it really added to the creaminess of the sauce and overall nom-factor. The final entrée was the Seared Duck Breast Noodle ($16). This dish was my favorite! Seared duck breast is served on top of fresh, thick ramen noodles, bok choy, shiitake mushrooms and poached daikon in a duck consommé. Since this is a broth based dish and awkward to share, I asked our server to have the chef split the entrée into two portions. Instead of splitting it PRIOR to bringing to us, he brought two extra bowls for us to split it. This was a bit awkward but I managed because the dish was THAT delicious. Overall, this is a solid new spot. I highly recommend checking it out!